A new species develops if a population which has become geographically isolated from its parental species acquires during this period of isolation characters which promote or guarantee reproductive isolation when the external barriers break down. Systematics and the Origin of Species: From the Viewpoint of a Zoologist (1942), 155. A species consists of a group of populations which replace each other geographically or ecologically and of which the neighboring ones integrate or hybridise wherever they are in contact or which are potentially capable of doing so (with one or more of the populations) in those cases where contact is prevented by geographical or ecological barriers. 'Speciation Phenomena in Birds', The American Naturalist (1940), 74, 256. 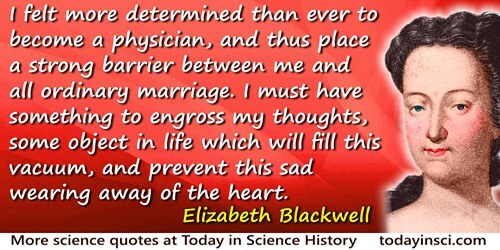 I felt more determined than ever to become a physician, and thus place a strong barrier between me and all ordinary marriage. I must have something to engross my thoughts, some object in life which will fill this vacuum, and prevent this sad wearing away of the heart. 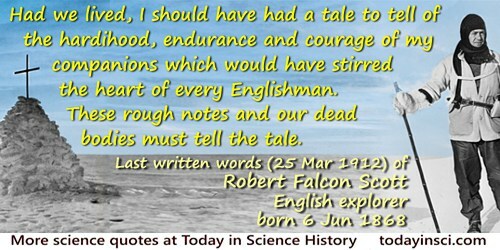 Entry from her early journal, stated in Pioneer Work in Opening the Medical Profession to Women (1895), 28. If the modern conception of the atom is correct the barrier which separated physics from chemistry has been removed. The Electron in Chemistry (1923), Preface.